Aikatsu Friends! – 041 | Mezashite! They’ve finally awakened!!!!!!!!!!! The Miracle Aura! Man, i have to say, so much times i don’t watch the presentations complete, i skip, but in this episode….it has perfect, i am really happy and surprised. Karen was channeling Zarathustra this week. There was even a child with a lion. Ok well, a tiger. Next week’s preview is looking like a repeat of the Star Harmony Cup somehow. I’m speechless to the point of having nothing else to say other than the episode itself was perfection. But then again, that’s a LMT-centric episode for you. Mixed (yet optimistic) feelings about this episode. The main portion was cute and had some funny one-liners but didn’t actually do or say much, so it felt more like filler than anything of substance. The “drama” was (as usual) a repeat of what we saw in Stars but executed fairly plainly, which is disappointing considering that I found last week’s drama to be an improvement. One step forward, now two steps back. Then there’s the stage. I don’t like the song and the Friends CG doesn’t always impress me, so the performance felt worse to me than some of the others we’ve seen before, like Maika’s ‘Girls Be Ambitious’. It almost seemed like they only got a bunch of applause because of all the effects. Maybe that abundance of special effects and particle effects cheapened (ha ha) the performance. It’s worth noting that Hayashi from Samurai Pictures didn’t help out on this stage like he did with some of the others, as he’s been working on Bandori and Kemono Friends 2. I’m reluctant to judge this episode on its own merits as it is clearly a setup for the rest of the season. Next week’s episode will likely be Pure Palette tying against Love Me Tear, sparking more competition between the two and motivating Aine/Mio. 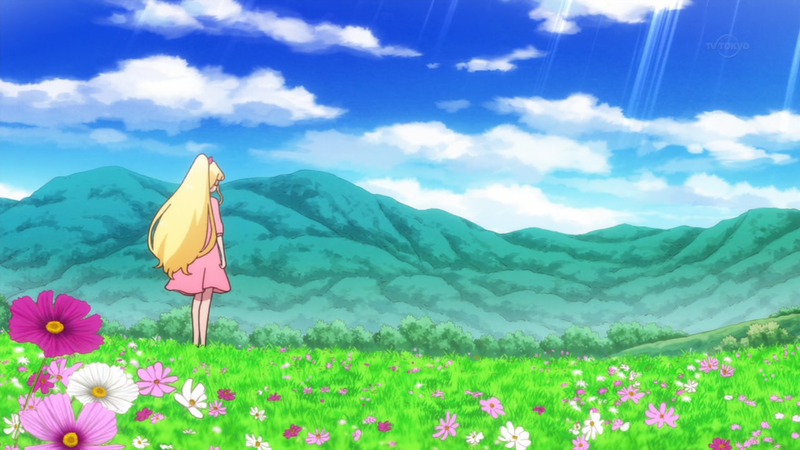 That’d be followed by a short training/friendship arc where (in part thanks to Maika, Ema and the Shirayuris) they finally realise they have a chance to reach the top, and finally, Pure Palette would overcome and out-Zone LMT around episode 50. The only line that really stood out to me this episode was the allusion to Icarus, with Karen asking Mirai if she’d catch her should she fall, but I’m pretty sure even that was done in Stars. Great episode especially the pajama party. But where is my “Believe It”, this song is truly THE love me tear song, don’t need another one.